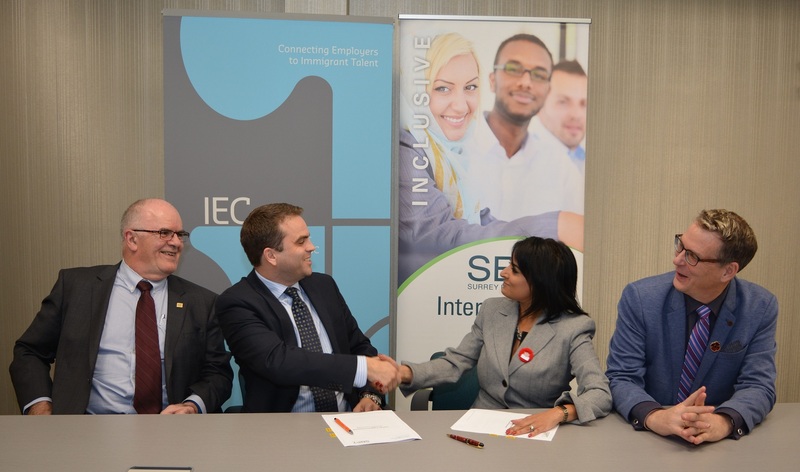 The Immigrant Employment Council of BC (IEC-BC) and the Surrey Board of Trade (SBOT) signed a memorandum of understanding to equip Surrey businesses with the tools, resources and workable solutions they need to connect with the refugee and immigrant talent. With a population of over 500,000, approximately 800 new residents every month, many of them immigrants and refugees, Surrey is consistently demonstrating leadership through various initiatives to welcome and integrate newcomers to Canada. Over the past several years, IEC-BC has worked closely with the Surrey business and community organizations to help newcomers effectively integrate in their new hometown, and the MOU takes this collaboration to a new level. “This Memorandum of Understanding will allow IEC-BC and the Surrey Board of Trade to meet workforce development goals that will provide long-term economic benefits to Surrey and its businesses,” said Patrick MacKenzie, IEC-BC CEO at the signing ceremony. The MOU, which will be in effect through March 31, 2020, aims to help Surrey businesses meet their talent needs while advancing their Corporate Social Responsibility objectives. share and build on success stories and best practices.